Designed for performance handling of liquids from a large variety of bottles and flasks, the dispensers combine the latest in dosing technology, high tech materials and ergonomic design. As a result, users benefit from universal chemical compatibility, ease of operation, superior safety and low maintenance. Volumes range 0.25 to 10 mL. 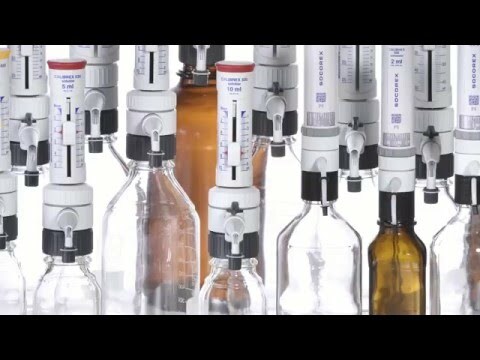 Fitting on most reagent bottles, this new dispenser generation is intended for the safe and reproducible liquid distribution. Excellent chemical resistance, robustness, ease of use and maintenance are all the more important for whom want to perform in the lab. Cat. No. Vol. mL Div. mL Min. vol. Mid. vol. Max. vol. Min. vol. Mid. vol. Max. vol. Adjustment is fast and precise even with a gloved hand. An efficient click-stop mechanism prevents unwanted alteration. Large display is easy to read; the window adjusts to desired side of instrument body. A true digital system contributes to the long-term calibration stability. Each step on the cylindrical cam is pre-calibrated and corresponds to one division on the volume adjustment scale. The instrument rotates 360° for adequate positioning on top of the bottle. Air inlet can be enlarged to receive a membrane filter, if airborne contamination is a concern. The CalibrexTM dispensers are factory calibrated, but can be easily recalibrated by means of a dedicated adjustment screw. Click stops of the 520 model provides for convenience and stability. Each stop corresponds to a given volume published in the calibration section of operating instructions. Disassembling / reassembling is facilitated by the limited number of well-connected parts - no tool needed. Key elements such as valves, plunger, barrel and delivery jet can be removed in seconds for cleaning. All CalibrexTM dispensers are autoclavable fully assembled at 121°C / 250 °F. Special attention is paid to component materials, providing for long instrument life. Parts coming in contact with the liquid flow are chemically inert. Printed QR code for instant access to chemical resistance chart. Dual scale enables volume reading from a wide angle. Locking position for safe dispenser transportation. Spring loaded sliding cursor softly moves up and down dual scale and precisely stops at desired graduation. Classical screw-type volume setting button easily replaces the original sliding cursor, according to user preference. Next to its dispensing position (2), device enables liquid priming and recycling (1) without reagent loss or contamination. Locking position (3) for safe dispenser transportation. Glass barrel with thick wall contributes to overall dispenser robustness. Thick, transparent protection around glass barrel enables visual priming control. At the same time, it reduces risks of spillage in case of breakage. The instrument rotates 360° for adequate positioning on the bottle. Free rotating dispenser body makes volume clearly visible from any position. Delivery jet absorbs shocks to reduce risks of breakage. Autoclavable seal sticker prevents unwanted access to the calibration mechanism. Replacement stickers available with each instrument or in larger quantities as spare. Mechanism with integrated key located under plunger cap. Engraved +/- arrows for easy and precise setting. Access protected by safety seal sticker. Disassembling/reassembling is facilitated by the limited number of well-connected parts – no tool needed. Key elements such as valves, plunger, barrel and delivery jet can be removed in seconds for cleaning. All models autoclavable fully assembled at 121°C. Parts in contact with liquid flow are chemically inert, providing for stability and long instrument life. Each dispenser bears its own serial number and passes a strict quality control attested by an individual certificate.